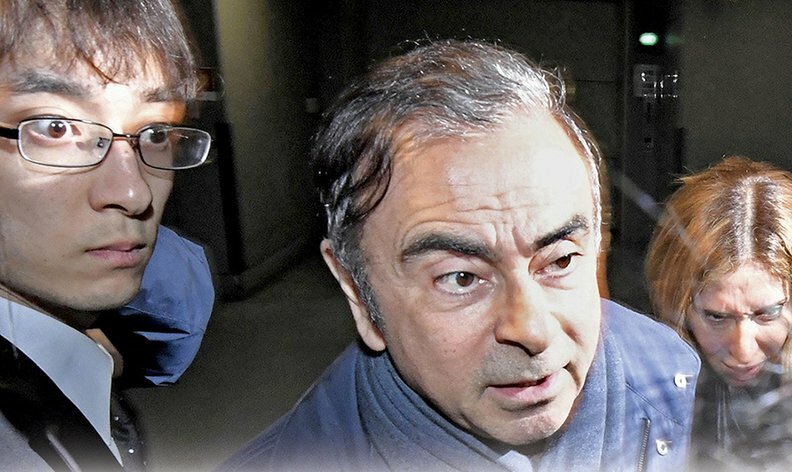 Former Nissan Motor Chairman Carlos Ghosn visits his lawyer’s office in Tokyo on April 3, before his rearrest the next morning. TOKYO — Carlos Ghosn was just beginning to settle in to his newfound freedom. The embattled auto legend — out on bail after 108 days in jail — was strolling Tokyo's picturesque Japanese gardens. And then came the whiplash. Last week, Ghosn was back in the Tokyo detention center where he was initially locked away after his stunning Nov. 19 arrest. As Ghosn faces new charges of diverting Nissan money for personal use, fresh doubts are emerging about whether the executive can get a fair trial in Japan. Shortly after being taken into custody, Ghosn issued a statement condemning his arrest as "outrageous and arbitrary" and vowing he would "not be broken." And hours before Tokyo investigators swept through his residence at 5:50 a.m., Ghosn told French media he likely faced imminent arrest, while reasserting his innocence. During their raid, prosecutors vacuumed up all manner of evidence used in Ghosn's preparation for trial — notebooks, phones and other materials — his lawyer Junichiro Hironaka said. They confiscated the passport and cellphone of Ghosn's wife, Carole, who was with him at the time. "We cannot deny the possibility that the rearrest was done for the purpose of taking these materials," he said. "As a civilized country, this is something that must not be accepted." Some legal observers in Japan said the rearrest gave prosecutors extra leverage. "The rearrest is intended to psychologically pressure Ghosn into confession," said Nobuo Gohara, a former Tokyo prosecutor now in private practice. Last week, Hironaka also took issue with the idea of putting Nissan and Ghosn on the stand together as co-defendants. Ghosn and the corporate entity are accused in two indictments of falsifying financial filings by failing to disclose $80 million in deferred compensation. Nissan is likely to cooperate with prosecutors. To bring Ghosn and Nissan before the same judge in the same court pits the defendants against each other, Hironaka said at a press conference. "It goes against the very spirit of a having a fair trial." It also raises the awkward scenario of Ghosn and Nissan CEO Hiroto Saikawa taking the stand side by side. As Nissan's top representative, Saikawa — the former Ghosn protégé turned antagonist — would likely be called to testify next to the very man he removed from office. Hironaka requested a separate trial for Ghosn, a move backed by outside lawyers. "To the eyes of foreign people, I think it would be better to have separate judges for Mr. Ghosn and for Nissan, which would make it easier for foreign people to view this trial as fair," said Yasuyuki Takai, another former Tokyo prosecutor. Hironaka also bemoaned what he said was the prosecutor leaking details to poison public opinion. The attorney said that has been the case since the arrest in November, when a Japanese video journalist recorded prosecutors boarding Ghosn's jet to make the arrest while it was still on the tarmac. And last week information leaked about the new charges. The new charges stem partly from Nissan's internal investigation of suspicious dealings with an independent vehicle distributor in Oman between 2011 and 2018. According to a person familiar with the matter, that probe claimed that Ghosn approved payments of around $35 million from Nissan to Suhail Bahwan Automobiles, run by billionaire Suhail Bahwan, a friend of Ghosn's. Nissan's probe found evidence suggesting Suhail Bahwan Automobiles may have supported Ghosn's purchase of a yacht and helped finance a company owned by Ghosn's son. The payments are believed to have come out of Ghosn's fund for ad hoc expenses. Hironaka said there was no reason to detain Ghosn again. The court, in granting bail last month, confirmed Ghosn poses no risk of flight or evidence tampering, he said. The arrest, Hironaka said, was carried out to collect documents and make Ghosn cave. "Using this rearrest to put pressure on the defendant," Hironaka said, "is hostage justice."